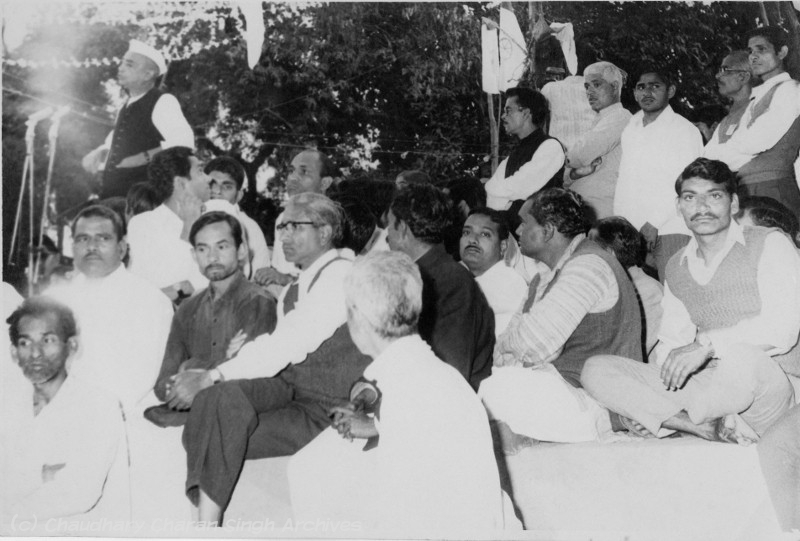 UP Legislative Assembly elections held in February 1974 in which joint coalition of BKD, SSP and Muslim Majlis won 106 seats under the leadership of Charan Singh against the Congress’ 215. Claims major coercion and ballot fraud by the Government. Realizes the Congress won with a minority (32%) of the votes polled due to a split in the opposition votes: while the BKD won 21%, Jana Sangh 17%, Congress (O) 8%, and Socialists 3%. Learns from his SVD experience where a disparate coalition pulled in contradictory directions and makes sincere attempts to forge opposition unity on the sustainable basis of an agreed party constitution, flag, electoral symbol and leadership as an alternative to the Congress. Thwarted by the Congress (O) and Jana Sangh who prefer to retain their separate identities. As a first step to a national alternative to the Congress, however, he constitutes the Bhartiya Lok Dal (BLD) on 29 August with the merger of the BKD, Swatantra Party, Samyukta Socialist Party, Uttkal Congress, Rashtriya Loktantrik Dal, Kisan Mazdoor Party and Punjabi Khetibari Zamindari Union.